The late, great comedian, George Carlin, had a routine about protecting the environment, in which he suggests that, “the planet is fine, but the people are f#$k@d.” You can watch the whole routine here. I believe that the government needs to make sure we balance between a sustainable economy and a sustainable environment. While such a position may appear reasonable at first glance, the truth is by failing to confront the reality of climate change, Gov. Walker and others like him, fail to understand that a sustainable economy cannot exist without a sustainable environment and failing to confront the human damage caused to our environment head on will result in economic disaster. As Governor Walker was tacitly denying the importance of climate change, he explicitly worked to undercut his own state’s Department of Natural Resources’ (DNR) ability to protect Wisconsin’s environment by issuing layoff notices to 57 DNR staff, 27 of whom are in the Bureau of Science Services, due to the Governor’s proposed drastic budget cuts. The timing was remarkable as these layoff notices were issued on Earth Day. For my own part, I have a small unpaid role in government which serves to protect the environment of a truly special place. I serve as the Chair of the Goose Lake Watershed District (GLWD) in central Wisconsin, where my wife and I have the privilege of owning a beautiful natural piece of land much of which remains untouched by human hands. When we first bought this land 23 years ago, we discovered that Sand Hill Cranes nested there, but since they had almost been wiped out due to the now banned pesticide DDT, there were very few. Fortunately, they have made a comeback, which has caused some to want to hunt them, which thankfully has not been permitted as of yet. In order to make sure the GLWD is monitoring the health of Goose Lake, I take the opportunity to explore the lake as often as possible, often by canoe. This past weekend, I had the remarkable fortune to notice that the GLWD’s work is paying off in the health of breeding water fowl. 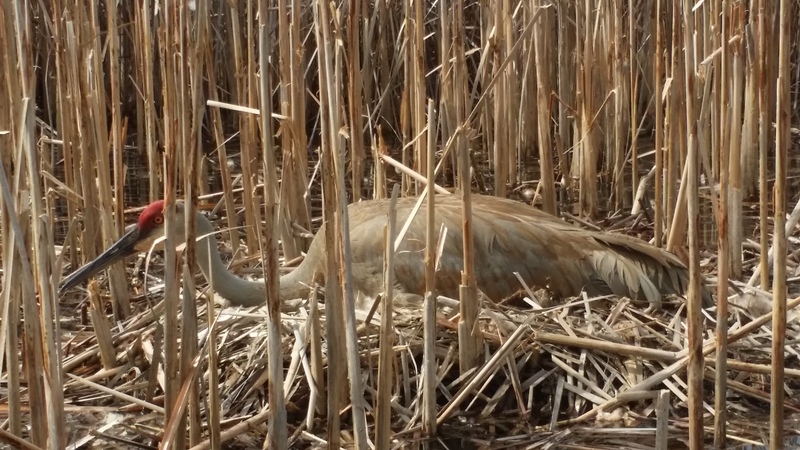 First, I noticed this magnificent Sand Hill Crane protecting her egg on her nest. 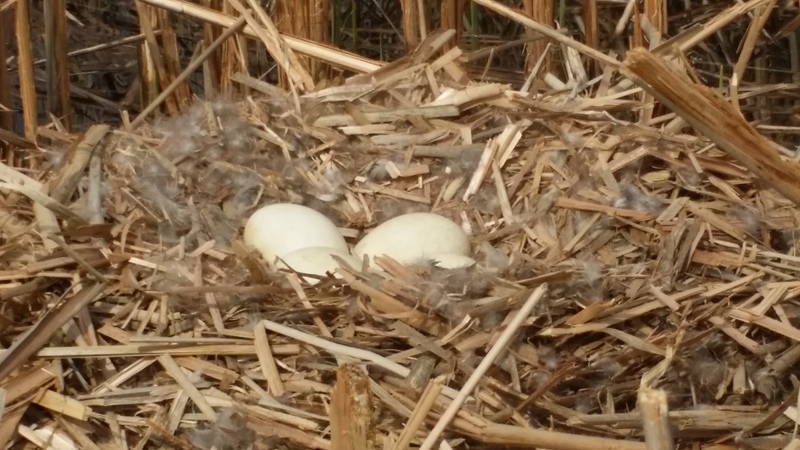 Then, my canoe must have startled a mother goose on her nest causing her to leave it and allowing me to take this picture of her eggs. These breeding waterfowl are signs of a healthy environment, but it takes work to sustain that health. It also takes an appreciation of these small things in nature in order to take personal action to protect the environment. President Obama understands this which is why he spoke to a group of 4th graders on Earth Day, and announced his initiative to provide free National Park access to all families of 4th graders, because providing our children with the appreciation of nature’s magnificence will inspire many to protect the earth in a manner which sustains the rich diversity of life on it, which is a never ending generational task. For more information on how Jeff Spitzer-Resnick can help you accomplish effective, progressive systems change contact him by visiting his web site: Systems Change Consulting.